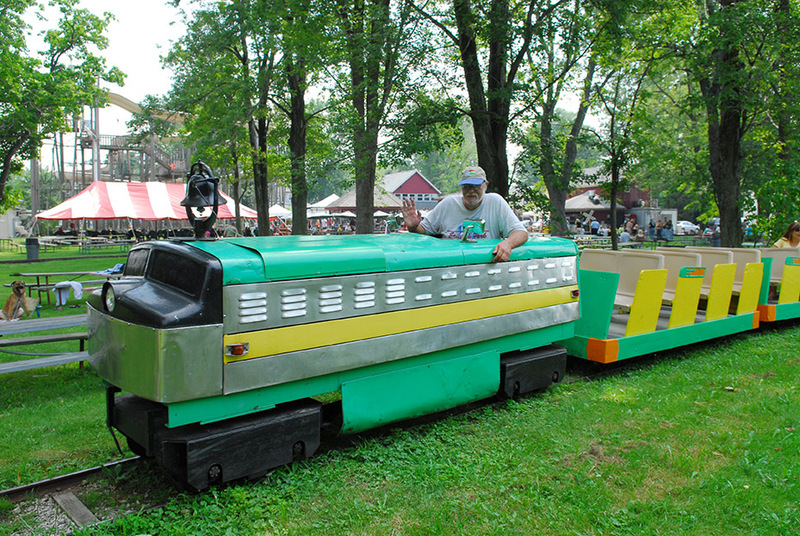 The Erieview Park train was nearing the end of the line when this image was shot in the summer of 2096. A second set of tracks ran next to the big train and accommodated youngsters riding self-propelled work cars. 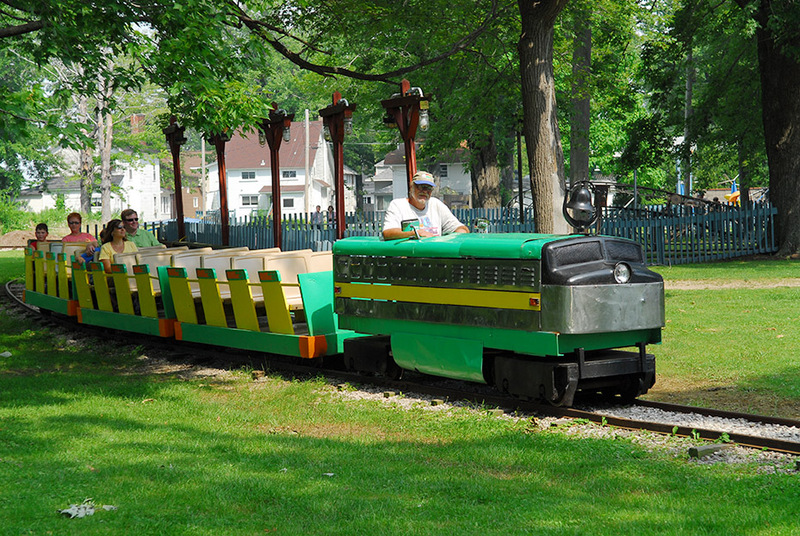 Many GOTL visitors recall the train that ran at Erieview Park from 1965 until the park’s closing until 2007. 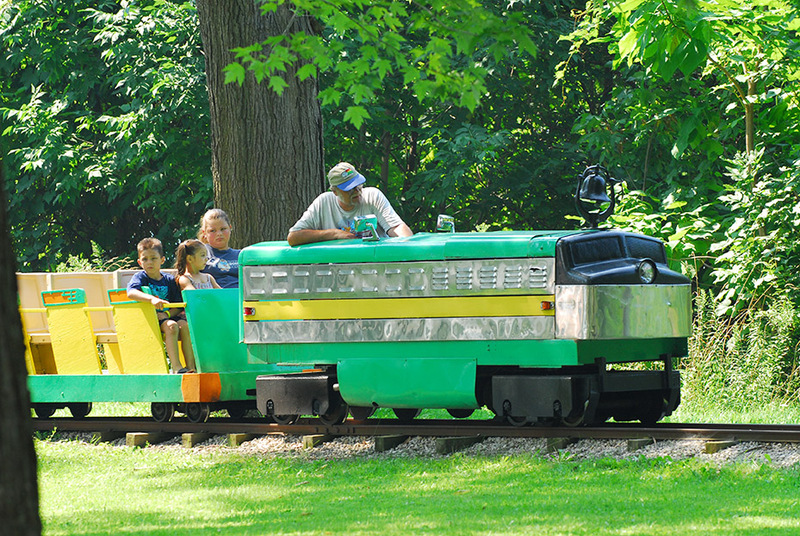 That train was purchased from Conneaut Lake Park and ran on a track at the north end of the park. However, prior to that train another miniature railroad operated on The Strip, between Howard Warner’s Colonial Hotel to the edge of the Municipal Golf Course. 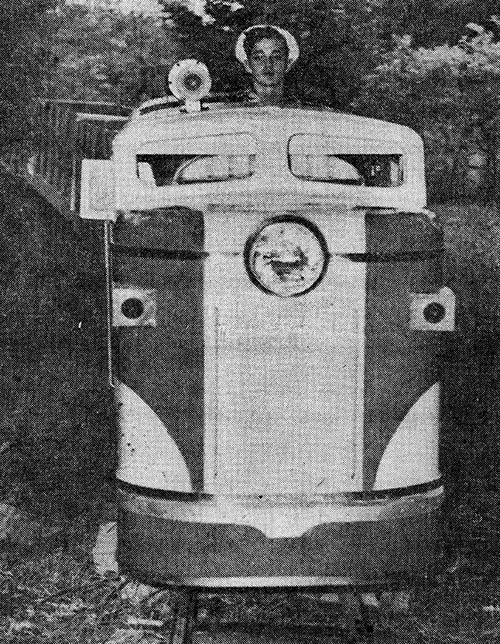 Roy McCormack of Conneaut built and operated the train, which, according to a newspaper article, was in operation during the summer of 1953. McCormack was a Nickel Plate Railroad employee who worked in the dispatching office at Conneaut. 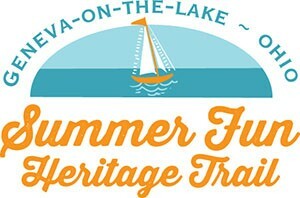 He got the idea for the train in 1940, while visiting another resort that had one. He drew plans for the train on grocery wrapping paper. His scale was 2 inches to the foot. The undercarriages for the train were machined by McCormack in the cellar of his home. He later rented a building in Conneaut for a workshop as the locomotive and cars got too large for the cellar. 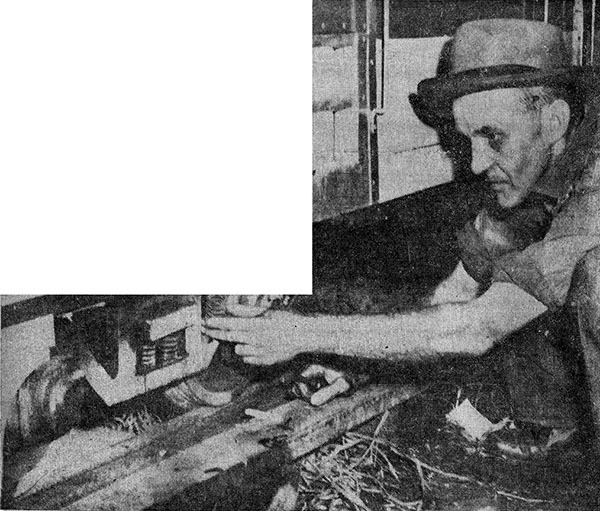 Roy L. McCormack inspects the undercarriage of a passenger car on his railroad. 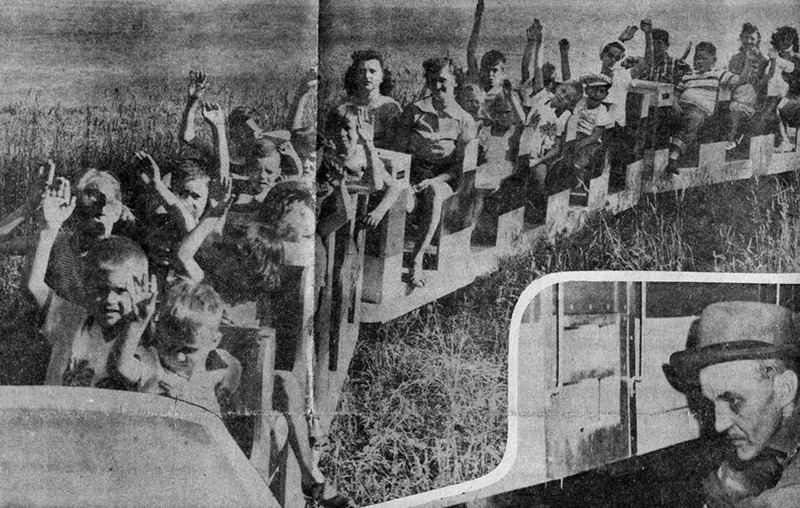 Image from the Ashtabula Star-Beacon, July 11, 1953. “I ran into plenty of trouble along the way. I used to lay in bed at night and study problems until I fell asleep,” McCormack told a reporter in 1953. The railroad ran on 1,500 feet of 16-gauge track set on 720 ties. The circular route was on the south side of The Strip. Co-workers at the Nickel Plate helped McCormack lay the track. The locomotive was 15 feet long and powered by an 8-cylinder motor. The locomotive operated like an automobile, with a foot brake, but the throttle was operated by hand. Each coach was 15 feet long and held 10 passengers. While McCormack ran the train at 10 to 12 miles an hour, he estimated that, at full throttle, it could do 45 miles per hour. A gallon of gas lasted for about 25 miles. It took McCormack about four years to build the railroad and get it running. In the summer of 1953, he spoke of future plans for the route, including a tunnel, miniature telegraph office and automatic signal devices. “I’m not through with this railroad yet. Not by a long shot. I’m going to make it the best railroad of its type in this area,” he said in 1953. Lawn McCormack, Roy’s son, is at the throttle of the locomotive in this 1953 photo. The locomotive was powered by an eight-cylinder engine and was painted red and yellow. Photos and text courtesy of the Ashtabula Star Beacon.